Today the My Favorite Things design team is sharing samples using four new digi-templates and a new digi-paper pack (now available)! 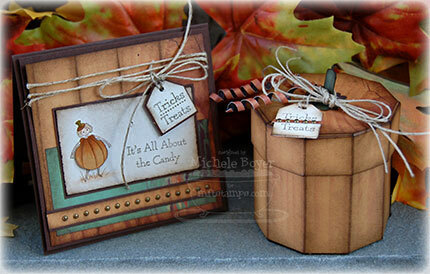 I’ve used MFT’s Tiny Town Halloween along with the Pumpkin Box template. I ***love*** the pumpkin box. I printed the template onto the back side of a woodgrain patterned paper, constructed my pumpkin and sponged all the edges and score lines, quite heavily, with Ranger’s Walnut Stain Distress ink. I wrapped one long thin strip of paper around a bamboo skewer to get the curly piece. After curling, I bent the piece just a bit in the middle(ish) and tucked it beneath my jute string before tying. I created a matching card using the same papers, scoring and inking. 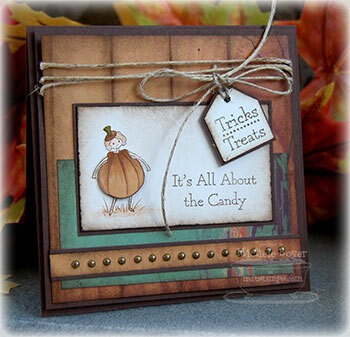 A small pop dot beneath the pumpkin costume added just a bit of dimension. And a little stamp and sentiment along with some sponging provided a quick finish to the inside. I hope you’ll check out what the design team has done with these new products! You can find direct links to the samples HERE after 11 a.m. EST. 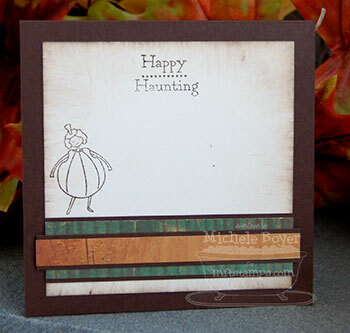 Stamps: My Favorite Things “Tiny Town Halloween” Ink: Ranger Walnut Stain Distress Cardstock: Papertrey Ink Dark Chocolate, Vintage Cream Patterned Paper: Cosmo Cricket Haunted “Nevermore” and “Them Bones” Accessories: MFT Pumpkin Box Template, Copic markers (E000, E31, E35, G21), jute string, Michaels mini brads, sponge, dimensional boosters. Pumpkin box approximately 3 ¼” x 3 ¼”; card 4 ¾” x 4 ¾”. 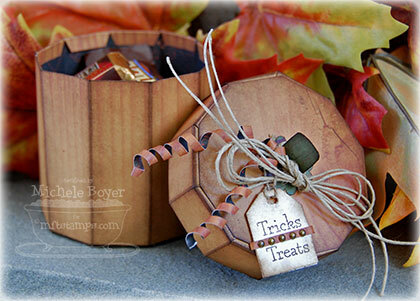 This entry was posted in Digi Image/Template, Gift Bags/Packaging, My Designs, My Favorite Things. Bookmark the permalink. 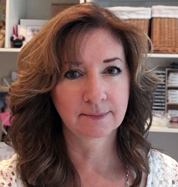 Michele, these are gorgeous! 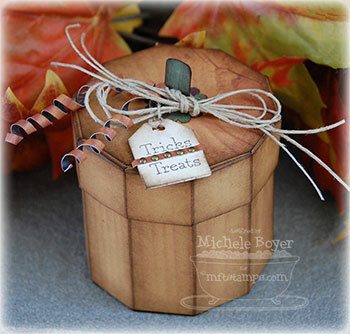 I love the woodgrain paper — the box looks just like a wooden box! 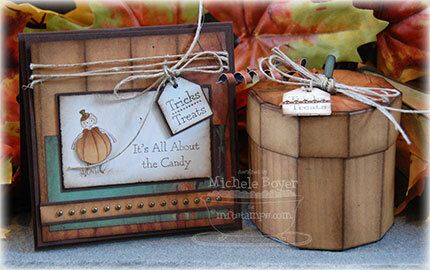 LOVE that pumpkin box! What a fabulous project! Turned out so cute! This is SO stinkin WOWZIE!!!!!!! LOVE all the detail and it is SO not “simple” my friend, it’s A-MAZE-ING!!!!!! you always add just the right touches! your card and box are simply gorgeous! looooove the colors! OMG, this is too adorable! I ***love*** that pumpkin box too!!! I guess I know what’s on my next order!! AWESOME, Michele! 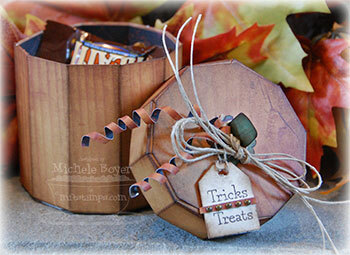 I LOVE that you used that woodgrain paper–total genius!! And all those little details just add so much! Oh I love it!!! Ok, I Have to tell you I think the idea of printing on the backside of a faux grained wood paper is a FABULOUS idea! I wouldn’t have thought of that!! And knowing that you cut it all out by hand is even more impressive – BRAVO!! This is wonderful! I just love how the wood grain papers look! Swoon!!! I love the wood grained paper, and the sponging, and your curly paper!!!! Just awesome Michele!! Oh my gosh, Michelle, this is so totally adorable! I love this set, very creative! I came across your blog looking for halloween deco, so adorable!! Does MTF do digi files still..i cant seem to find the template file anywhere…Help please!